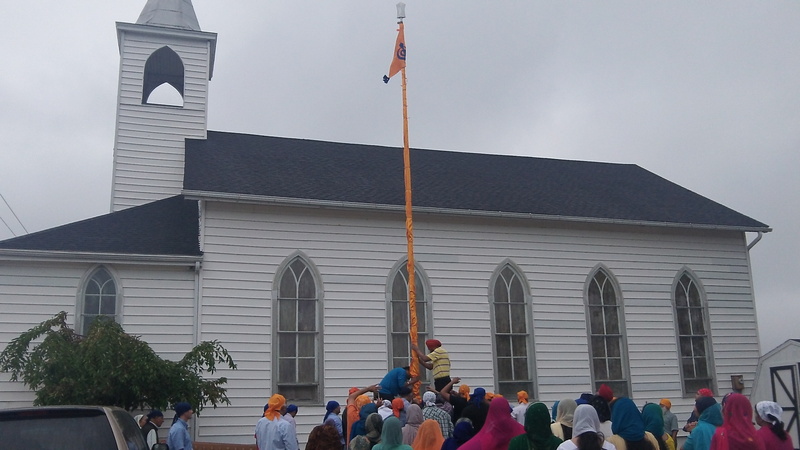 Last Sunday, Sikhs in the Fort Wayne, Indiana, area held a ceremony for the raising of the Nishan Sahib, the Sikh standard that identifies every Sikh house of worship, at the Sikh Gurdwara of Fort Wayne in Roanoke, Indiana (located at 11431 Lower Huntington Road). This ceremony takes place just after another Sikh congregation in Fort Wayne had recently begun construction of a new place of worship as well, which demonstrates the growth of the Sikh community in the Fort Wayne area. Thanks to Lori Way for the photo. You can visit the Sikh Gurdwara of Fort Wayne website here.